The Speedy Buggy is an ideal aid that makes it easier to use a wheelchair on loose or uneven ground. It is suitable both as a pushing aid with a companion and to make it easier for the wheelchair user to power the wheelchair. 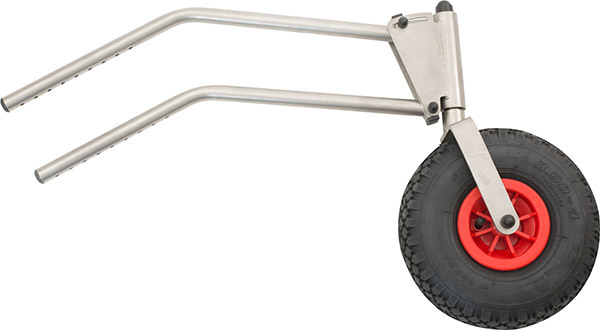 When travelling on uneven ground, such as cobblestones or grass for example, vibrations are drastically reduced and rolling is made much easier. The reason for this is that the small front wheels of the wheelchair are also raised here. On loose surfaces, such as beach sand for example, the buggy wheel almost completely avoids sinking thanks to the wide surface of the tyres. In combination with the Offroad wheelchair, or the twin wheels of the Speedy, the Buggy is the ideal assistant, particularly on loose sandy ground. The plain bearing is water resistant. The Speedy Buggy can thus be safely driven in sea water without damaging it. Due to its small size, you can very easily transport the Speedy Buggy in a car. If you already use another Speedy device, the coupling is also suitable for use with the Speedy Buggy. This makes it an optimum additional device, which can be used spontaneously when needed.